BACKGROUND AND PURPOSE: In this study, we present our experience with 11 patients with ruptured cavernous sinus aneurysms causing carotid cavernous fistulas (CCFs), to assess the incidence of ruptured cavernous sinus aneurysms causing CCFs and evaluate clinical presentations, treatments, and outcomes. PATIENTS AND METHODS: During a 10-year period, 10 of 689 (1.5%) endovascular-treated ruptured aneurysms were ruptured cavernous sinus aneurysms causing CCF. One additional patient with a CCF died shortly before treatment of intracranial hemorrhage. All patients had audible pulsatile bruit. Exophthalmus, ocular motor palsy, and decreased vision correlated with venous drainage to the superior ophthalmic veins and intracerebral hemorrhage was associated with major cortical venous drainage in 2 patients. RESULTS: Two low-flow CCFs closed spontaneously before treatment with resolution of symptoms; the aneurysms were subsequently treated. 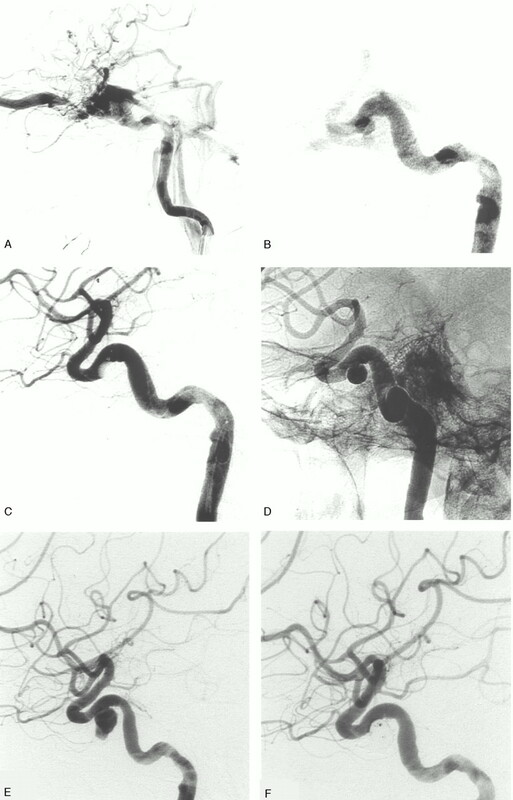 Eight CCFs were successfully occluded, 5 by coil occlusion of the aneurysm, one by occlusion of the aneurysm with a balloon, and 2 by simultaneous coil occlusion of the aneurysm and internal carotid artery. There were no complications of treatment. Visual acuity returned to normal in all but one patient, and ophthalmoplegia was cured in 6 of 8 patients. In 2 patients, a remaining abducens palsy was surgically corrected. CONCLUSION: The incidence of CCF by a ruptured cavernous sinus aneurysm was 1.5%. CCF was the presenting symptom in 24.4% of treated symptomatic cavernous sinus aneurysms. Clinical symptoms correlate with venous drainage. Drainage to cortical veins may lead to intracranial hemorrhage. Endovascular treatment with coils is effective in occluding the fistula. Although direct surgical clipping of cavernous aneurysms is possible,4 the preferred treatment is endovascular, either by selective occlusion of the aneurysm or endovascular occlusion of the parent internal carotid artery, with or without previous bypass surgery. The primary goal of treatment of CCFs caused by ruptured cavernous sinus aneurysms is closure of the fistula by balloon or coil occlusion of the aneurysm or occlusion of the carotid artery by trapping the fistula. In this study, we present our experience with 11 patients with ruptured cavernous sinus aneurysms causing CCF. Between January 1995 and January 2005, 1880 aneurysms were treated at our institution. Surgery was performed in 948 aneurysms, and 932 aneurysms were treated by endovascular techniques: selective aneurysm occlusion with detachable coils was performed in 841 aneurysms and parent vessel occlusion in 91 aneurysms (57 occlusions of the internal carotid artery and 34 occlusions of vessels of the posterior circulation). Of 932 endovascular-treated aneurysms, 689 (74%) had ruptured. 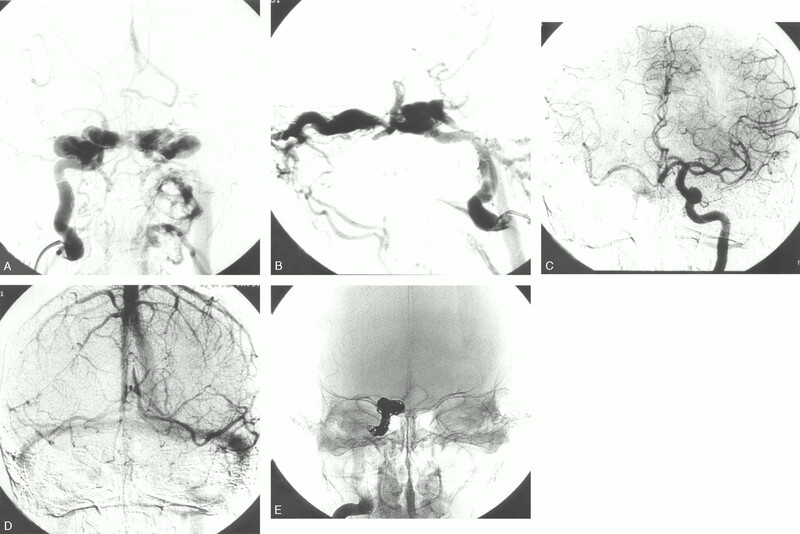 Of all 1880 treated aneurysms, 51 (2.7%) aneurysms in 51 patients were located in the cavernous sinus. All 51 aneurysms were treated by endovascular methods: selective occlusion with coils in 22 and parent-vessel occlusion in 29 (5 after bypass surgery). Of the 51 aneurysms in the cavernous sinus, 41 were symptomatic, 9 were additional to another symptomatic aneurysm, and one was an incidental finding. Presentation of 41 symptomatic cavernous sinus aneurysms was mass effect (ophthalmoplegia, decreased vision) in 28 (68%), CCF in 10 (24%), SAH in 2 (5%), and epistaxis in one (2%). During the study period, one patient with a ruptured cavernous sinus aneurysm causing CCF died of intracranial hemorrhage shortly before scheduled treatment. The present study group consists of 11 patients with ruptured cavernous sinus aneurysms causing CCF: 10 patients who were treated and the single patient who died before treatment (Table). The patients included 8 women and 3 men, with a mean age of 61.6 years (range, 27–77 years). CCFs were classified according to flow rate into 3 categories: high, intermediate, or low flow. In high-flow CCFs, all the blood from the internal carotid artery entered the fistula without filling of intracranial vessels (Fig 1). In intermediate-flow CCFs, both the fistula and intracranial vessels received blood from the internal carotid artery (Fig 2), and in the low-flow CCFs only slow and sluggish filling of the cavernous sinus was apparent. Patient 6. Ruptured left cavernous sinus aneurysm in a 70-year-old woman with bilateral exophthalmus, ophthalmoplegia, and decreased vision. A, Frontal view of left internal carotid artery angiogram. High-flow CCF with venous drainage to both cavernous sinuses, superior ophthalmic veins, and inferior petrosal sinuses. There is some cortical venous drainage, but no filling of intracranial vessels. B, Right carotid angiogram demonstrates overflow to the left side and some contribution to the CCF. C, Early arterial phase shows the aneurysm. D, Coiling with balloon protection of the carotid artery. E and F, Closure of the CCF with patency of the internal carotid artery. Patient 9. Ruptured right cavernous sinus aneurysm in a 74-year-old woman with bilateral exophthalmus, ophthalmoplegia, and decreased vision. A and B, Frontal (A) and lateral (B) view of right internal carotid artery angiogram. Principal venous drainage to both cavernous sinuses and superior ophthalmic veins. There is some cortical venous drainage. E, Occlusion of the ruptured aneurysm, including the internal carotid artery, with coils. Endovascular treatment was performed under general anesthesia on a biplane angiographic unit (Philips Integra V3000 Neuro; Philips Medical Systems, Best, the Netherlands). In cases with rapid shunt to the cavernous sinus, additional filming was done, at 6 frames per second, to visualize the aneurysm in an early arterial phase before the cavernous sinus was opacified (Fig 1). After completion of the diagnostic work-up, in most cases a test occlusion of the ipsilateral carotid artery was performed to establish whether the patient could tolerate permanent occlusion of the carotid artery in case carotid sacrifice would be necessary to occlude the fistula. For that purpose, an over-the-wire balloon catheter (Sentry 15 mm; Boston Scientific, Freemont, Calif) was positioned close to or over the neck of the aneurysm and inflated to occlude the carotid artery and a second catheter was used for internal carotid and/or vertebral artery angiography to assess collateral circulation with emphasis on synchronous opacification of cortical veins of both hemispheres.5 After the test occlusion, the balloon catheter was deflated and left in place to assist in coiling of the ruptured aneurysm. The second catheter was subsequently also positioned in the ipsilateral carotid artery and served as a guide for the microcatheter that was placed inside the aneurysm. After positioning of the balloon and the microcatheter, coiling was started with protection of the internal carotid artery by the balloon and continued until the fistula was closed. In one patient (9), the neck of the aneurysm was wider than the protective balloon and, because test occlusion indicated tolerance, both the aneurysm and carotid artery were occluded with coils (Fig 2). In another patient (10), with a left CCF, tortuosity of vessels precluded a femoral approach to the left carotid artery and only one catheter could be positioned via direct carotid artery puncture. Test occlusion indicated tolerance, and both the aneurysm and carotid artery were occluded with coils. In one patient (4), a small ruptured cavernous sinus aneurysm was occluded by placement of an intrasaccular detachable balloon (Fig 3). Angiographic follow-up after 4–6 months was performed for all treated patients. Patient 4. CCF in a 61-year-old woman with bilateral exophthalmus, ophthalmoplegia, and decreased vision. A, Lateral view of left internal carotid angiogram shows CCF with principal venous drainage to both cavernous sinuses and superior ophthalmic veins. There is some cortical venous drainage. B, Early arterial phase shows small cavernous aneurysm. C and D, Selective occlusion of the aneurysm with a detachable balloon. E and F, Follow-up angiogram after 4 months shows reopening and enlargement of the aneurysm, subsequently occluded with coils. The incidence of ruptured cavernous sinus aneurysms causing CCF was 1.5% (10 of 689 endovascular treated ruptured aneurysms). Ruptured cavernous sinus aneurysms causing CCF accounted for 24.4% (10 of 41) of treated symptomatic cavernous sinus aneurysms. Clinical presentation, treatment, and outcome are displayed in the Table. All patients had an audible pulsatile bruit at presentation. Other clinical symptoms correlated well with venous drainage of the fistula: uni- or bilateral exophthalmus, ophthalmoplegia, and decreased vision were the key clinical symptoms when drainage was to the ipsi- and/or contralateral superior ophthalmic vein(s). Major retrograde drainage into the cerebral cortical veins in 2 patients was associated with intracranial hemorrhage in both. Two low-flow CCFs closed spontaneously between diagnosis and planned treatment with resolution of symptoms. In one of these patients the cavernous sinus aneurysm was occluded with coils, and in the other patient the aneurysm was treated with balloon occlusion of the parent carotid artery. Eight CCFs were successfully closed: in 7 patients with coils and in one patient with a detachable balloon. In 2 patients both the aneurysm and carotid artery were occluded with coils, and in 6 patients the CCF was closed with sparing of the carotid artery. During follow-up, 2 aneurysms that were occluded with coils showed reopening by compaction and were coiled for a second time. 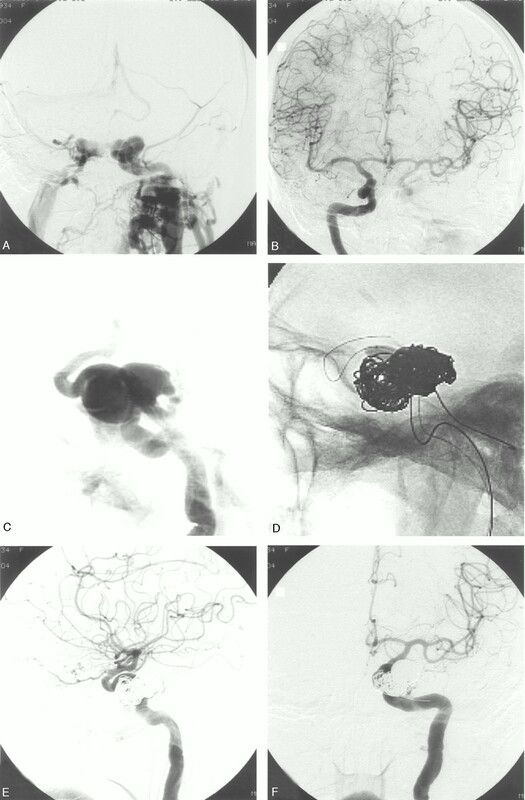 The aneurysm that was occluded with a detachable balloon reopened at follow-up and subsequently was occluded with coils (Fig 3). Clinical follow-up showed complete recovery in 7 patients, remaining abducens nerve palsy in 2 patients (in both cases treated with surgical shortening of lateral rectus muscle), death in one patient, and in one patient the left eye had to be enucleated. Although carotid cavernous fistulas as a result of a ruptured cavernous sinus aneurysm are rare and comprised 1.5% of endovascular-treated ruptured aneurysms in our institution, they accounted for 24.4% of all symptomatic cavernous sinus aneurysms. Clinical presentation is usually an acute onset of ocular symptoms and a pulsatile bruit is invariably present. Clinical diagnosis of a spontaneous CCF (caused by a ruptured aneurysm or a dural fistula) is simple by auscultation on the skull where the pulsatile bruit can be heard. Other symptoms correlate well with venous drainage: when drainage is to the superior ophthalmic veins this leads to ocular motor palsy, exophthalmus, conjunctival injection, and decreased visual acuity. Major cortical venous drainage was present in 2 of 11 patients and was associated with venous hemorrhages, a phenomenon analogous to dural arteriovenous fistulas or traumatic CCFs with cortical venous drainage. When the clinical diagnosis of CCF is established with auscultation, adjunctive MR imaging or contrast-enhanced CT scanning is of little value but may reveal dilated superficial veins, an ominous sign of cortical venous drainage. Angiography establishes the diagnosis and can differentiate between a CCF caused by a ruptured aneurysm and a dural fistula. Although CCFs from ruptured cavernous sinus aneurysms may close spontaneously, as in 2 of our patients with low-flow CCFs, angiography and endovascular closure of the fistula should follow promptly to prevent possible hemorrhage from engorged cortical veins.6–8 After closure of the fistula, exophthalmus and conjunctival injection quickly resolve. Except for the one patient in whom an eye had to be enucleated because of extreme exophthalmus, visual acuity was restored in all and ocular motor palsy was cured in 6 of 8 patients. In 2 patients, complete ophthalmoplegia improved to abducens palsy. In conclusion, the incidence of CCF by a ruptured cavernous sinus aneurysm was 1.5%. CCF was the presenting symptom in 24.4% of treated symptomatic cavernous sinus aneurysms. Clinical symptoms correlate with venous drainage. Drainage to cortical veins may lead to intracranial hemorrhage. Endovascular treatment with coils is effective in occluding the fistula. Accepted after revision April 8, 2005.